Cheesecakes are one of my favorite desserts to make, in part because they are so darn easy to put together in addition to having the ability to be combined with everything, short of the kitchen sink. For the most part, I start with a time-tested base for my cheesecake and tweak it from there. 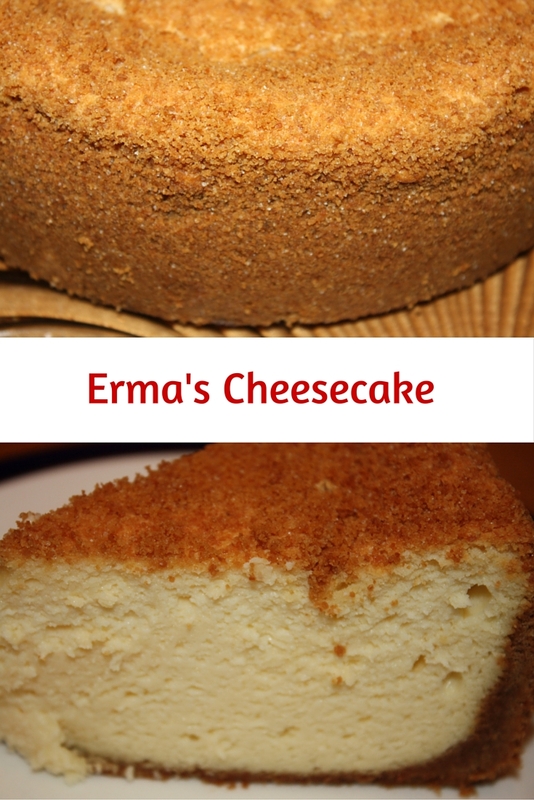 Yet there is one recipe that stands apart from every other cheesecake I have ever had and that is Erma’s Cheesecake. Erma Weinthal was my father’s sister’s mother-in-law. Mel Brooks made an hilarious movie, “Spaceballs,” that is a spoof of “Star Wars.” This movie comes to mind as I write the description of how I knew Erma, because in it, an actor is explaining his relationship to someone who in fact isn’t a relative at all. Why the connection? Because Erma was not really related to me, but I always tell the same long-winded story when explaining how I knew this lovely lady. Anyway, back to Erma’s Cheesecake. It looks like a giant graham cracker, if a graham cracker were the shape of a 9” round springform pan with a lid. You see, this cheesecake is surrounded by the crust, all the way from the bottom, up the sides and then, finally, to the very top, where the crumbs are sprinkled. Now there are other cheesecakes that may look similar to Erma’s, but I can pretty much guarantee you that none of them taste like this one. The ratio of sugar to cream cheese is higher than I usually go; yet with the two cups (yes you are reading that correctly!) of sour cream, it works out to perfection. The end result is the lightest cheesecake I have ever had. 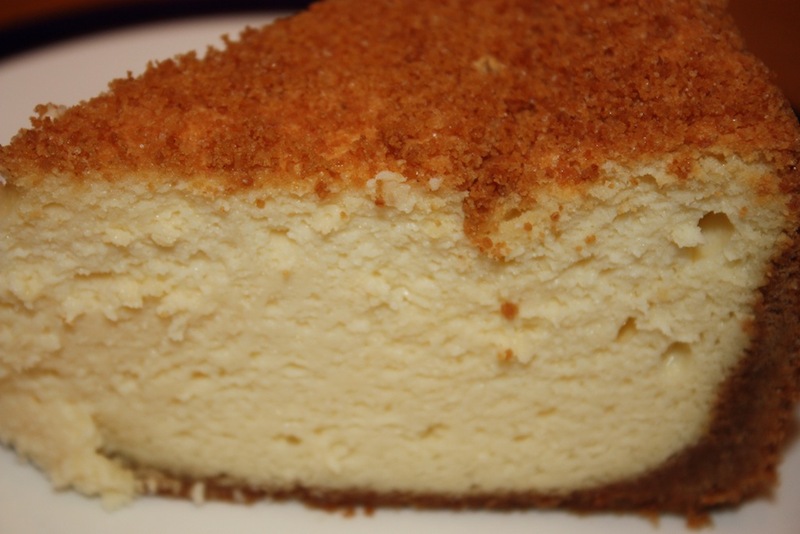 With all that sour cream, I would have thought the cake would feel like lead, but Erma’s Cheesecake has almost a spring to it, a fluffiness I have not seen or tasted in any other cheesecake, probably because the egg whites are beaten separately and then folded into the final batter. Preheat the oven to 325°. Butter the bottom and side of a 9" springform pan and set aside. Combine the graham crackers and sugar in a food processor fitted with a metal blade and process until it is the consistency of powder. Add butter and pulse on/off until well blended. Set aside ¼ cup of the mixture, which will be used to top the cake. Transfer the remaining crust mixture to the pan and pat evenly onto the bottom and up the sides. Set aside. Beat the cream cheese and sugar until smooth and creamy, about 3 minutes, scraping the bowl down as needed. Add the egg yolks and mix until smooth. Blend in the sour cream. Add the vanilla and cornstarch. Set aside. Place the egg whites in another mixing bowl fitted with a whisk attachment. Beat on high speed until stiff peaks form when the beater is raised. Fold the whites into the cream cheese mixture in 2 or 3 additions. Pour the filling into the pan. Sprinkle the topping evenly over the cheesecake. Bake at 325° for 1 - 1¼ hours, the top will crack slightly and will be toasty brown in color. Turn off the oven and let the cheesecake cool completely in the oven before taking it out. Gently remove the side of the springform pan. Refrigerate for several hours before transferring the cheesecake to a serving plate. Slide a long metal spatula under the cheesecake and gently rotate it around the springform bottom to loosen the cake. Use the spatula to help guide the cheesecake to a serving plate. The cheesecake may be served directly from the bottom of the springform pan if you do not want to transfer the cheesecake to a serving plate. Simply place the springform bottom directly onto the serving plate instead. A variation of Erma’s Cheesecake is to top with your favorite fruit topping. Do not remove ¼ cup of the crust when doing this. I’ve often heard it said that your favorite food is the last one you have eaten. That said, I know I won’t insult any of the other divine cheesecake recipes of yours that I have made. Yes, this was my favorite. This is the traditional cheesecake, that for 1/2 my life was the only kind I ever got to eat. It is outstanding. So creamy and ever so tasty. Perfect. One bit of warning: Nabisco has reduced the size of their graham cracker (there are still 20 to the pack; but each cracker is smaller). The recipe calls for 20 graham crackers. They won’t tell me, as of this writing, how many more crackers I need to compensate for the shrinkage of their package; but as soon as I find out, I’ll let you know. The result was I had more butter than I needed. I still want the same amount of butter; I just want the correct amount of graham crackers. FYI, after making two crusts and having them identical, I googled it and found everyone concurred with my findings. But, no one could tell me how many more crackers to add. Most people switched brands; I’m determined to find the answer. Thanks for another amazing recipe. I’m so glad you love Erma’s Cheesecake. Please let me know what Nabisco says. There will be a lot of adjusting going on!